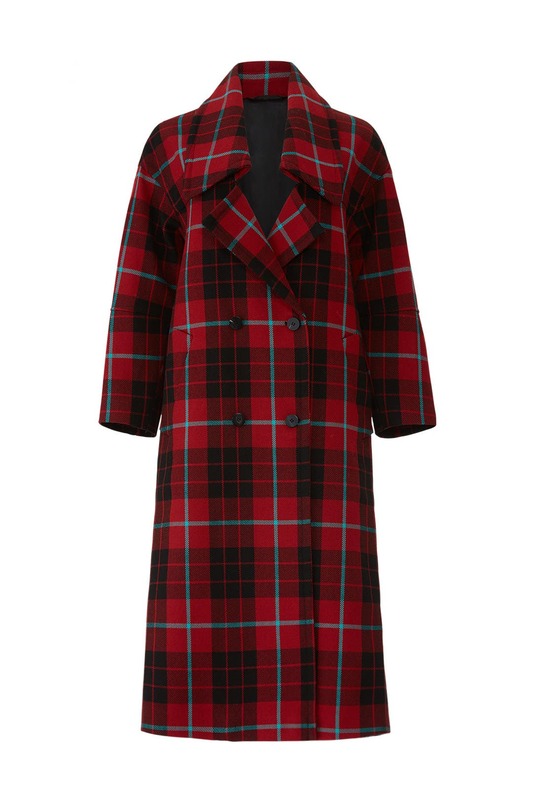 We're most definitely mad for this plaid MARYLING jacket crafted from luxe cashmere. Style with the Small Field Messenger Bag by rag & bone Accessories. 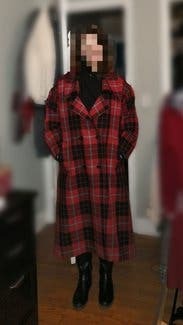 Red plaid tweed (100% Wool). Coat. Long sleeves. Exposed front button closures. Pockets. Fully lined. 46.75" from shoulder to hemline. Imported. Was so excited on seeing this. Thought it would be my winter coat from unlimited. Only size was 42. I could tell it would run big but decided to take a chance w it since it was the only one. It was so huge I couldn't even wear it just for a weekend - it was laughably large. I would def need two sizes smaller. So size down! It is so cool but also on a 5'3 frame might be too long- it has some gorgeous pleat details in the back that even if I sized down don't know if they would fall in the right place. It was such a shame to send this back even though it was new with tags but it was just gigantic. 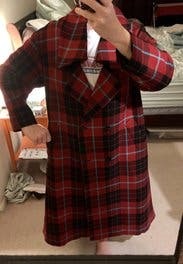 Hope someone else can enjoy this coat, probably need to be 5'5 or taller and order two sizes down! 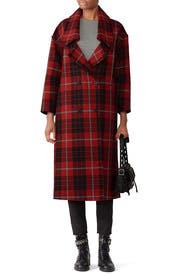 This coat is beautifully made but definitely oversized. 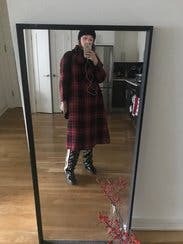 I chose my true size despite the comments because i really wanted to try this coat but should really have sized two down. Was fun for the weekend! BEAUTIFUL coat! Heavy and kept me warm. I love oversized coats so this was a perfect choice for me. I received compliments everyday I wore it. Excellent quality! 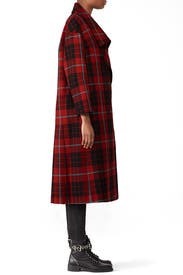 I love oversized coats, but this one was ridiculous. I read all the reviews so I sized down. I'm a size 12, rented size 8. I returned and checked to see if they had sizes 2 or 4 available, no luck passing on this one. Wore this coat for a couple weeks mid-February and got a reputation around the office for having noteworthy style. My boss called it "very soul train" and I got compliments in the elevator from other tenants in the building who work at architecture and design firms. Turns heads in soho!! I wish I could afford to keep it. Warm and stood out in a sea of black winter coats. Kept this one a while! This cost is huge! It's great for layering. 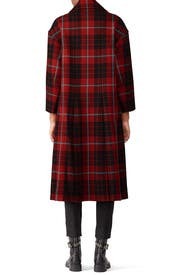 I'm pretty tall, so I can handle the length and oversized look, but would size down if I rented this item again. I actually couldn't wear the coat, it was much too large. The fabric is beautiful, and the teal/blue color pops really nicely (better than pictured). That said, its HUGE! I'd order 2 sizes down, and expect an A-line fit still. But the silhouette works with a slightly exaggerated collar and waist level buttons (allowing it more movement while you walk). pretty fun coat! definitely kept me warm! 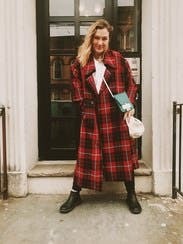 liked it just for everyday with jeans and a T. wore it a couple times and felt pretty cool with it on, tartan is one of my favorite prints! I just didn't love the open neckline when it was buttoned up, thought it was much nicer to leave open. Beautiful fabric but very large fit which was odd with not-quite-3/4 length sleeves. If sized down - and if you don't mind shorter sleeves - the fabric and tailoring are of very high quality. 2-3 sizes too big - i read the reviews and thought it could be a little roomy, but had no idea it was going to fit the same as a sleeping bag. Definitely go at least 2 sizes down, if not 3. I wasn't a fan of the neck cut anyways, so will not be ordering in my size. Downsize by two to three sizes. Read reviews stating that coat ran huge, so sized down a size. This made it a bit smaller, but still large. Sleeves, however, were too short with arms bent at smaller size, but barely long enough with arms straight. Aside from that, coat was stylish, warm and well made. This was GIANT on me! And I consistently fit into a size small or 6. I was so confused. The coat is absolutely beautiful though. As other commenters noted, the fit is oversized and boxy, with shorter sleeves. Note that the chest is quite open and it's *long* Otherwise warm, comfortable and catches people's eye. I felt it was a little too bulky and out there for work, but a great cool-weather item. I ordered 2 sizes down and it was still too large. Big in the shoulders, but short arms. The fabric is beautiful, but the cut is very slumpy. I like structured looks for work (trial lawyer) and this just looked sloppy.